Listed below in reverse-chronological order are descriptions and photos of recent past Stretch Glass Society events. Please note that past Annual Conventions and Stretch Glass Discussions have their own dedicated pages; click the links in this sentence to navigate to those respective listings. 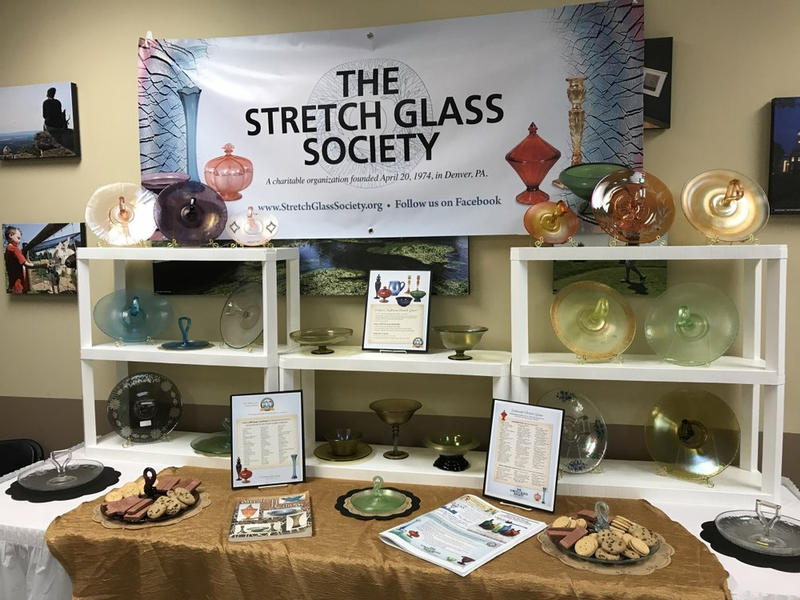 The Stretch Glass Society was front and center at the Eastern National Antique Show on May 4-5, 2018 in Carlisle, PA. We featured Center Handled Servers to promote our annual convention club display. VP Bob set a table for dinner to show how stretch glass can be used with other china and glass. Stretch Out Discussion Deluxe Report Editions were available to visitors at our booth along with recent issues of the SGS Quarterly. Our booth also included a new stand up banner promoting membership in the SGS. 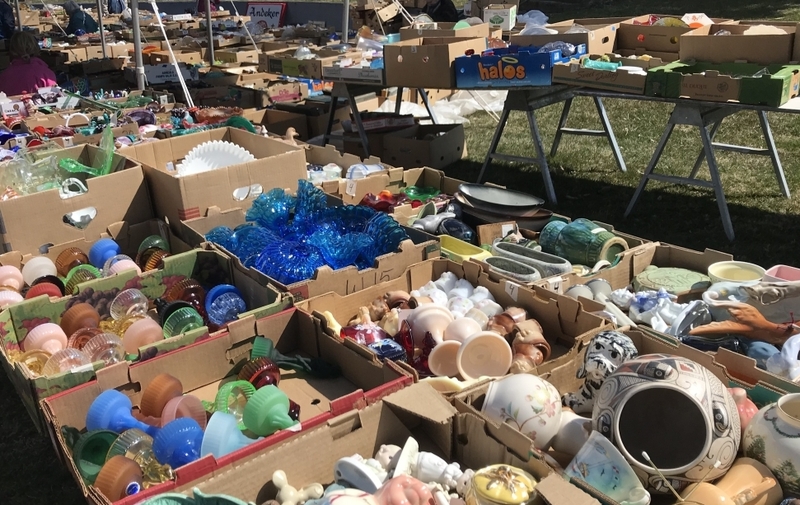 About 800 boxes of items belonging to the late Bill Crowl, including stretch glass, Fenton glass, Imperial glass and more, were auctioned by Randy Clark Auctioneers over the weekend of March 24-25, 2018. 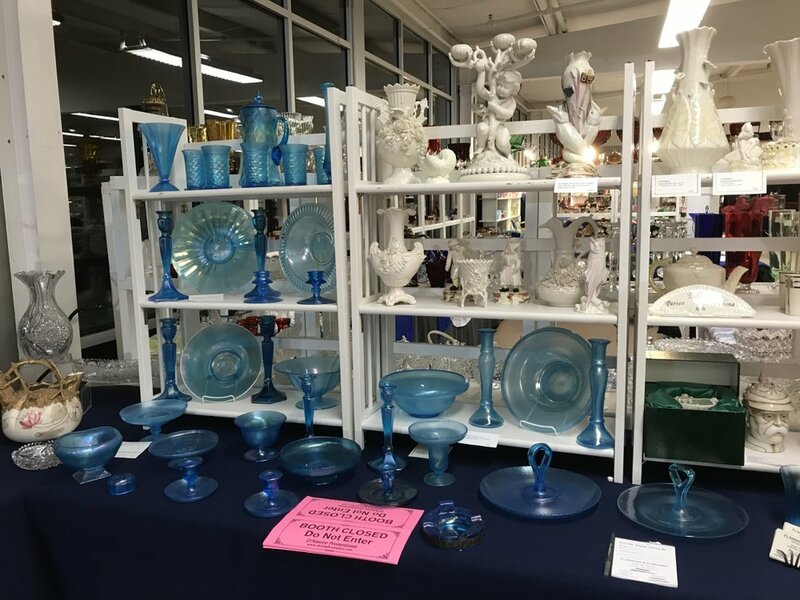 Tom and Debra Burns conducted an all-stretch-glass auction on Sunday, November 19, 2017 at Bath Fire Department Community Center in Bath, New York. It was a cold and windy day outside, but a dedicated group of stretch glass enthusiasts numbering about 20 showed up in person while many more were at home bidding on line and a few placed their bids by phone in the first All-Stretch-Glass auction we have seen in quite a while. 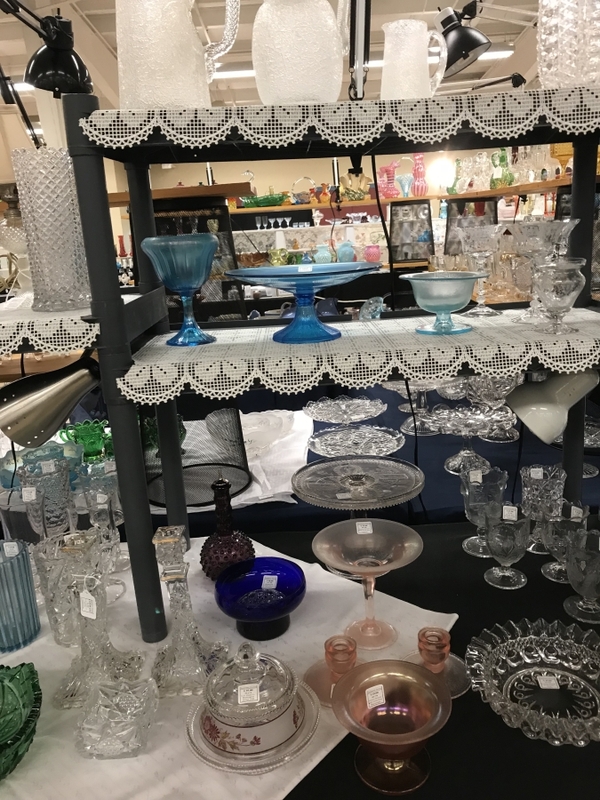 With 360 advertised lots, some consisting of multiple items, plus a few surprises at the end of the auction, the gallery was filled with stretch glass for inspection prior to the auction start. Stretch Glass Society President Cal Hackeman and Vice President Bob Henkel promoted the SGS at the Eastern National Antiques Show, a 2-day event held Friday-Saturday, November 17-18, 2017 at the Carlisle Expo Center in Carlisle, PA. Here is a gallery with a few views of the SGS booth as well as stretch glass which was offered for sale by various dealers -- quite a few dealers had stretch glass for sale. The Stretch Glass Society is now the proud owner of the original Fenton Art Glass Company moulds for the Melon Rib #847 bowl and cover and the #1532 twin dolphin candy jar and cover. The purchase of these moulds was made possible by a very generous contribution to The SGS several months ago. Stretch glass was on display July 22-23, 2017 at the 42nd Annual Duncan Miller Glass Show, produced by The National Duncan Glass Society in Washington, PA. Helen and Bob Jones transported and set up the display to help us increase the awareness of stretch glass among all glass enthusiasts. The Stretch Glass Society made several appearances in the April issue of The Journal of Antiques and Collectibles. SGS had the ad shown to the left in the issue along with an announcement of the 2017 Convention and a club listing. The club listing will continue to appear for the remainder of the year in their club listings. Be sure to check out this issue to learn about stretch glass and The Stretch Glass Society, as well as all the other types of glass featured. 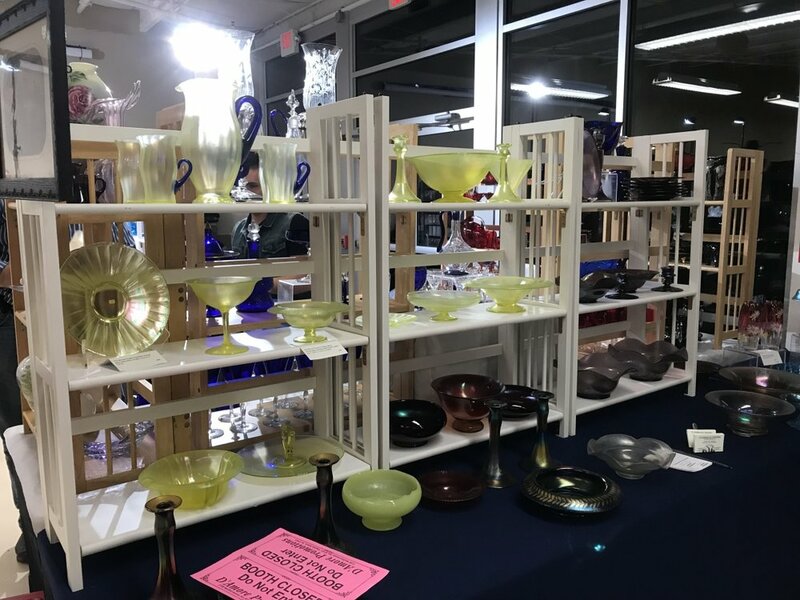 Nearly 100 iridescent glass collectors and enthusiasts gathered at the Tampa Bay Carnival Glass Club convention in St. Pete Beach on February 8 – 11, 2017, to learn about carnival and stretch glass, buy and sell iridescent glass and make new and renew friendships with fellow collectors. Cal Hackeman, SGS President, and Bob Henkel, SGS Vice President, attended the convention and provided those in attendance at the Friday night Banquet with a display of 175 examples of vintage and contemporary stretch glass along with an overview of the history and makers of stretch glass as well as information on the colors and items available for purchase during the original production period (1916-mid 1930s) and the later re-introduction by The Fenton Art Glass Company from 1980 until 2011. A significant interest in stretch glass was evident during the entire convention with several glass dealers offering stretch glass, in addition to carnival glass, for sale. For story with complete set of photos, click here. The SGS was on-hand at the recent Eastern National Antique Show held in Carlisle, PA on November 18th and 19th. Bob Henkel, Vice President of the SGS assisted Cal Hackeman, President with set-up of the SGS display. Bob was also on-hand to greet and chat with those who visited the SGS booth. 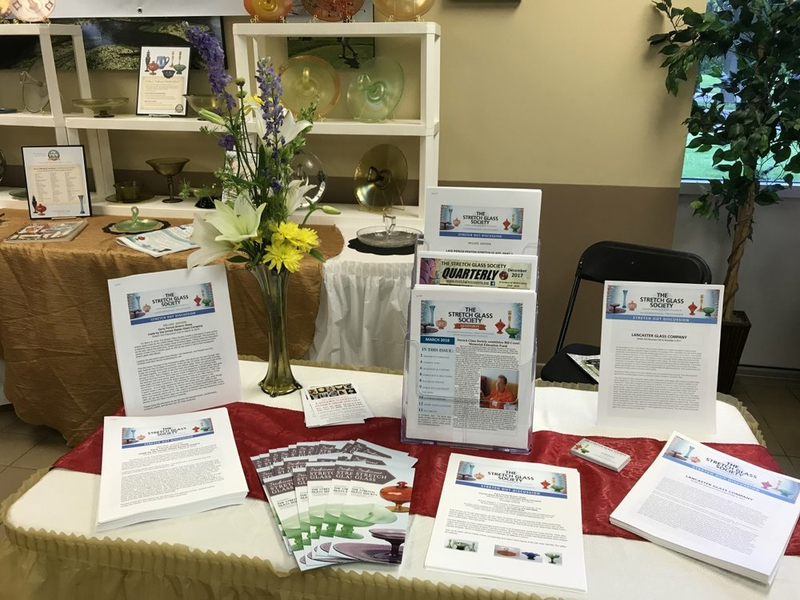 Along with the beautiful stretch glass being displayed at our booth, SGS Quarterlies and brochures were distributed as well. The SGS welcomed 2 new members joining on the spot! Attendees were able to register to win a very nice topaz opalescent stretch glass bowl. About 10 dealers, including SGS Members Ed Sawicki and Helen & Bob Jones had stretch glass for sale in their booths. Many folks attending the show commented on how beautiful stretch glass is. Several others asked questions about stretch, including some of the dealers in the show who specialize in other types of glass. Those dealers were very interested in learning more about stretch! We hope you enjoy these pictures of the beautiful stretch glass that was for sale at the show. Please note, these pictures are only a sampling of the stretch that was for sale. 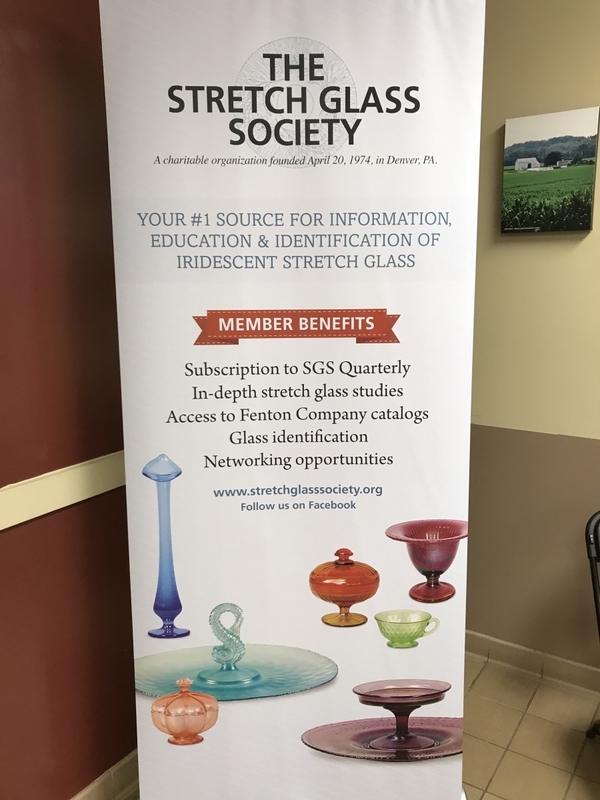 The efforts of the Stretch Glass Society seem to be paying off with all of the various organized displays and presentations made by a good number of SGS members during this 100th year celebration of the introduction of iridescent stretch glass to the American consumer. Dave and I were honored to be invited to the Great Lakes Carnival Glass Club to take part in their 2016 convention with Dave as their convention banquet speaker (I was his most important assistant and time manager). In fact, this was quite a ‘déjà vu’ occasion since we were there about eight years ago giving a very similar presentation. We have to thank the GLCGC members, and especially Maxine Burkhardt and Wally McDaniel, for the warm reception. It has long been known that many collectors of iridescent glassware share interest in any glass having an iridescent treatment. 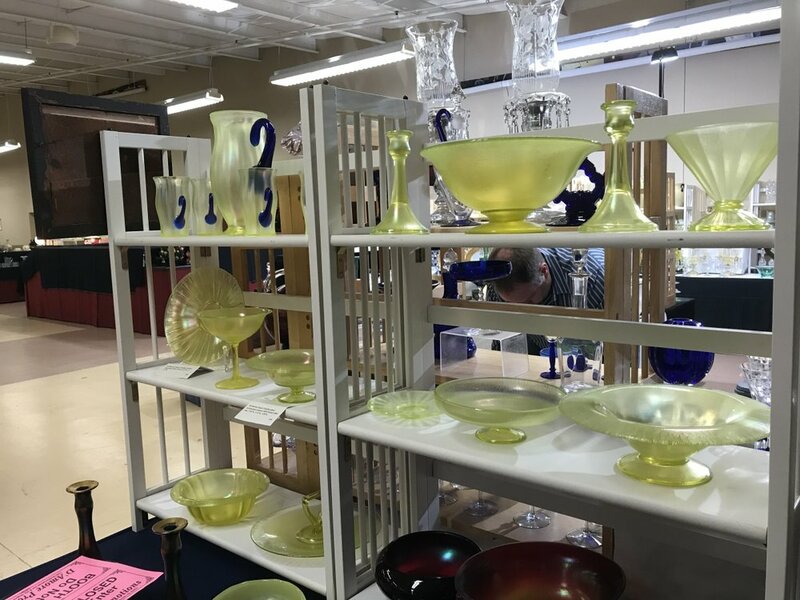 We might favor or specialize in one form or another, but most have an example or two of another form—carnival collectors often have examples of stretch glass or brocaded glass and we know of a number of stretch glass collectors who have a number of pieces of carnival for example. Such cross-over interest was the basis for Dave’s presentation. Dave, always the educator, began with his PowerPoint presentation to review the “basics” about how stretch glass is produced and how that technique differs from the production of carnival glass. To illustrate these production comparisons, he also made use of several of our videos from the SGS archives of SGS souvenir and whimsy production by the Fenton Art Glass Company. He also reviewed the stages of iridescent production by showing the epergne horn examples which were passed around among the audience. Also included was a discussion of the companies which produced stretch glass, the unique and the common colors that they produced. 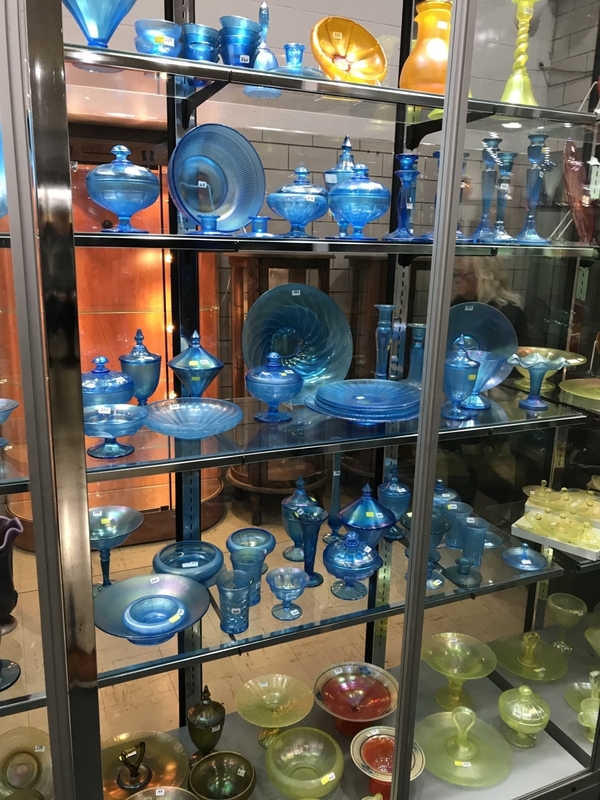 To illustrate this, he had a display of some of the major producers including Fenton, Diamond, Northwood, Imperial and U.S. Glass. Many of these examples were also passed around the room for the audience to see and feel, up close, the colors and textures. After being quizzed several times, by the end of this segment, all could answer who made Russet! 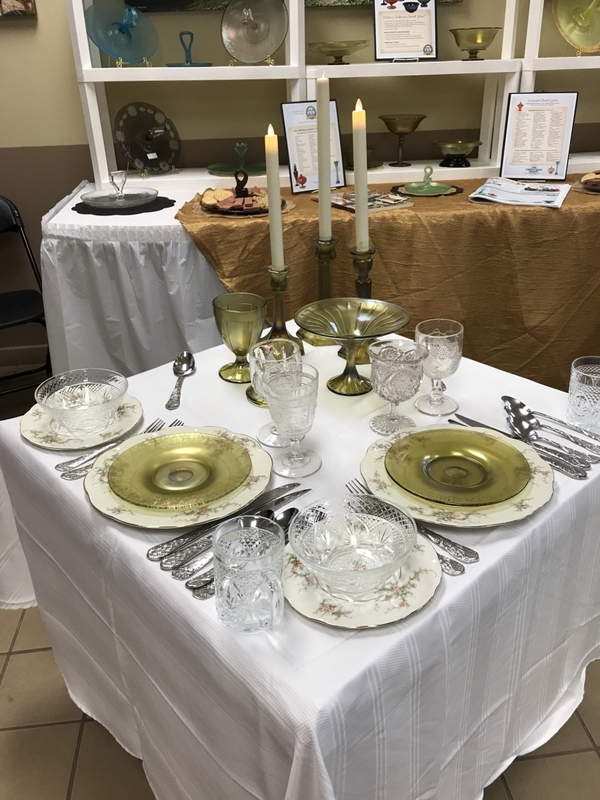 The final half-hour to 45 minutes of the presentation was a discussion of how to identify the similar-looking pieces – “colonial” candleholders, “cathedral” candy jars, covered bonbons and the ground marie plates. Even though we were well past 90 minutes into the presentation, about 3/4ths of the audience were “hanging in there” eager to learn these secrets. At one point, while taking two of the bonbon lids around for folks to get a close-up look at the lip comparison between the Fenton and the Northwood lids, one woman commented to me that she would never be able to remember that! I told her that was okay and that I’ve heard the same comment from some of our own SGS members! It’s just a matter of repetition. Past SGS Co-Presidents, Dave & Renée Shetlar, and current SGS President, Cal Hackeman, presented a seminar at “The Gathering” on Saturday, October 22, 2016, in Cleveland, OH. They talked about the early days of stretch glass production (1916-1930s) as well as the contemporary production period (1980s-2011) and discussed the various companies which produced stretch glass, the array of colors in which stretch glass is available, the wide assortment of items available in stretch glass and how to use stretch glass to decorate and entertain in 2016. A display of approximately 60 examples of stretch glass will be available for attendees to admire. HAPPY 100TH ANNIVERSARY STRETCH GLASS!!! Long time collectors and enthusiasts of stretch glass, Kitty and Russell Umbraco, did a terrific display celebrating the 100th Anniversary of Stretch Glass. Their display was featured at The Northern / Central CA Carnival Glass Convention in Fresno, CA on October 7, 2016. WOW!!! Let's all celebrate 100 years of stretch from 1916 - 2016. Wonderful display Kitty and Russell!! Click on the images (cover, left, and article, right) to enlarge. Stretch Glass Society President Cal Hackeman was a featured speaker at the 2016 National Fenton Glass Society (NFGS) Convention, representing SGS. The three-day NFGS Convention began immediately after the SGS Convention ended, also in Marietta, Ohio. 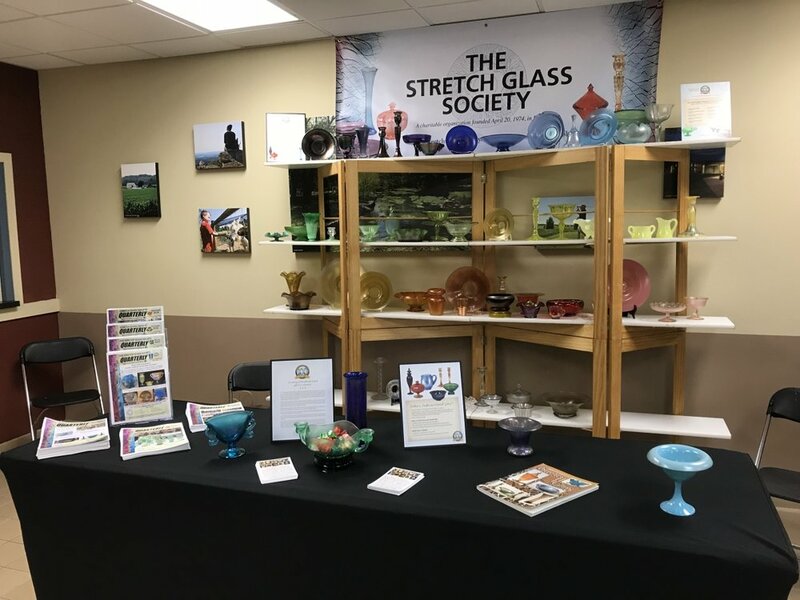 The traveling exhibit of 100 examples of stretch glass was on display at the National Cambridge Collectors’ 2016 Glass Show & Sale in Cambridge, OH. Many thanks to SGS members Bob & Helen Jones for once again transporting and setting up the display. This glass show features a number of quality dealers, some of whom only exhibit at this show. 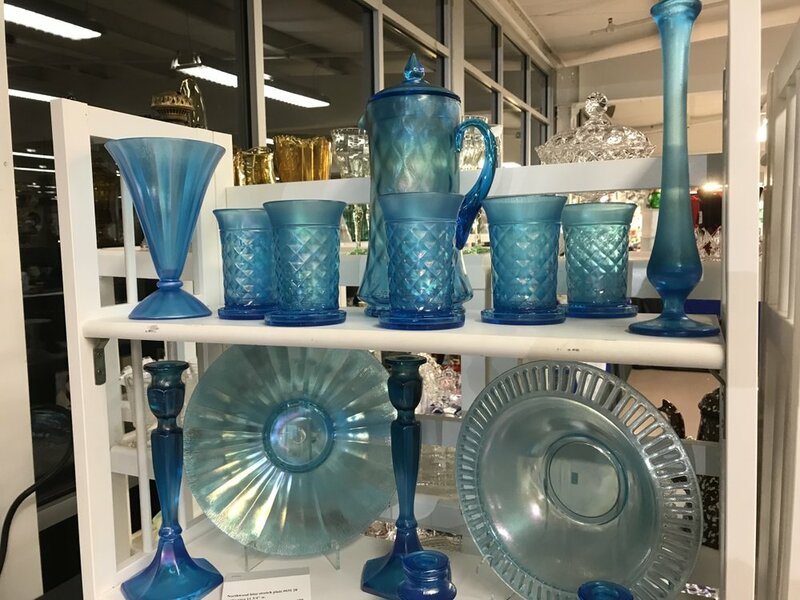 While there is an emphasis on Cambridge glass (obviously), the products of many of the other American glass manufacturers are also to be found. 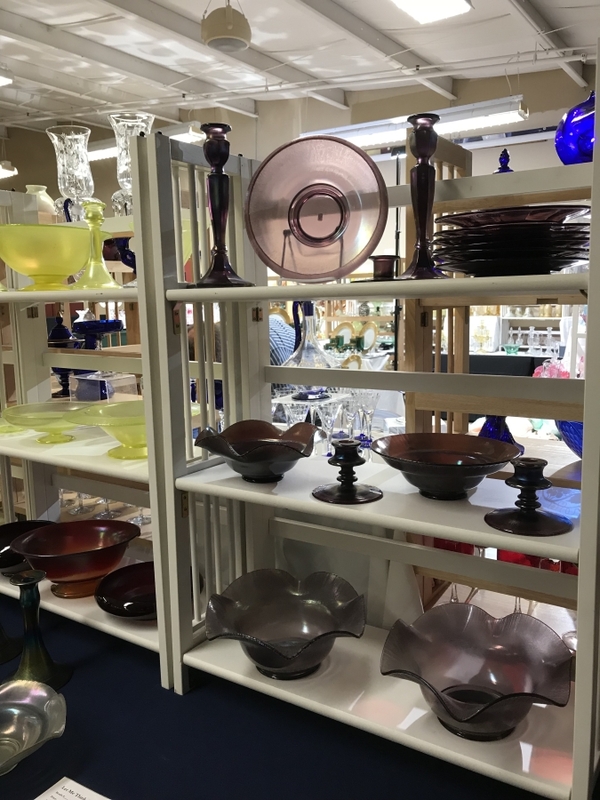 The 2016 Glass Show & Sale featured glass by Cambridge, Heisey, Imperial, Morgantown, Fenton, Duncan Miller, Tiffin, Westmoreland and much, much more. The show was held at the Pritchard Laughlin Civic Center, Cambridge, Ohio. 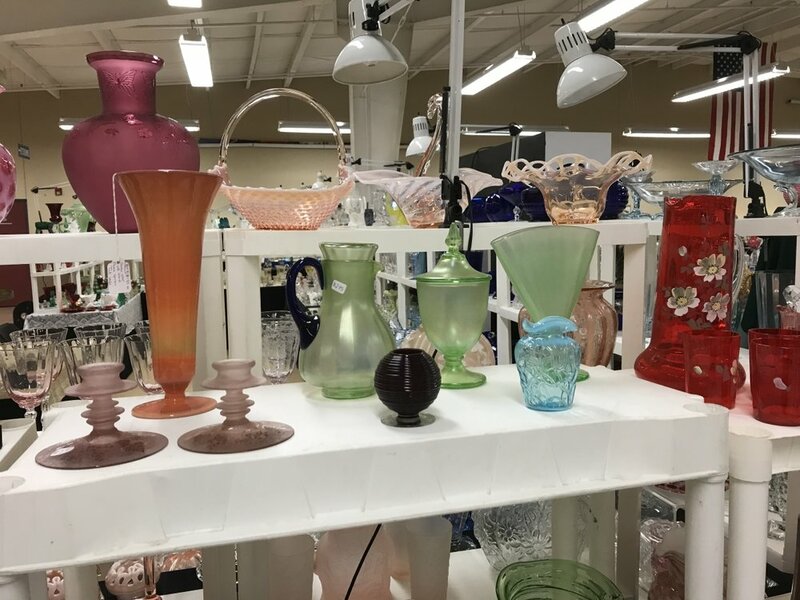 Exit 176 off interstate 70 on Friday, June 24 - 1:00 p.m. to 5:00 p.m. , Saturday June 25 - 10:30 a.m. to 4:00 p.m.
Kitty & Russell Umbraco displayed stretch glass at their Reno Bottle Show at the Grand Sierra Hotel, in Reno, NV on July 15-16, 2015. They report that they put out a stack of SGS handouts and quite a few people took them. The show had front page newspaper coverage so they had quite a crowd coming through. Russell reports, “Lots of 'tire kickers,' but many of them were people that collect other things than bottles. Could have sold the Stretch Glass pieces a number of times…” We thank Kitty and Russell for helping us promote stretch glass in preparation for the 100th-anniversary celebration in 2016.